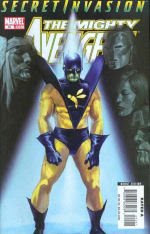 Hank Pym, ex-Yellowjacket, Ant-Man and Goliath, was, at some point, replaced by a Skrull as part of their Earth Invasion plan. This issues gives you the backstory on those events. We see how the volatile, destructive relationship between Hank and Janet Pym (aka Wasp) leads to him falling under the influence of a female Skrull disguised as a beautiful British student. From there on in, we see Hank embrace the Skrull mission with shocking ease - and the final panel is a disturbing 'here, my dear' moment as Hank and Janet are briefly reunited. Review - these titles (Mighty & New Avengers) lift Secret Invasion from the average to the sublime. You have to read this. 8.5 out of 10.